Rheumatoid arthritis is one of the chronic systemic diseases of the connective tissue etiology is unclear. Clinically, the arthritis is manifested by progressive destruction of small and peripheral joints, which occurs on the type of erosive-destructive symmetrical polyarthritis. Pathology is based on an autoimmune inflammatory process, which, most likely, is genetically determined. This pathology occupies one of leading places among all diseases with articular syndrome. It represents an unsolved medical problem since there is no effective causal treatment method, and also the proven way to stop the progression of disease. In the next stage, pannus penetrates into the actual cartilage from the synovial capsule and destroys it. In place of destruction, the synthesis of fibrous tissue and its calcination, develops fibrous or bony ankylosis. Changes are detected and in the bones. For example, the x-ray visible are the signs of rheumatoid arthritis, such as rheumatoid granulomas in the epiphyseal areas of the bones. Tissue joint capsule thickens and sklerosiruta, which is manifested by deformities of the joints, change their shape and size in the pictures. Subluxation of the wrist in the ulnar direction, which is combined kulinarnym curvature of the fingers. Palmar subluxation of the proximal phalanges. The hyperextension of the proximal phalanges with compensatory flexion of the distal part of the palm (fingers in the form of a Swan neck). Reverse pattern with flexion of the proximal and distal extension (deformation type of buttonhole). Eversion of the subtalar joints of the foot. Plantarii subluxation of the metatarsal bones. Dorsal subluxation of the toes. It is important to understand that the x-ray dynamic, and changes depending on the stage of the disease. In the initial stages of x-ray gives little diagnostic information compared to clinical examination and laboratory tests. 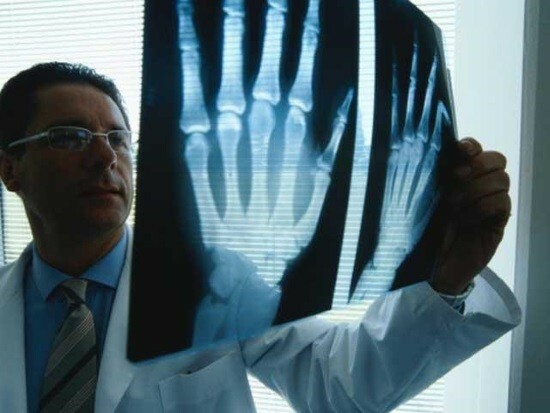 However, with the progression of the disease, changes become more pronounced, x-ray examination can detect signs of rheumatoid arthritis and confirm the diagnosis. It should be noted that x-rays can detect a characteristic of arthritis is the symmetry of the lesions. A few months beam diagnostics can detect osteoporosis, foci enlightenment of bone tissue and impoverishment of the trabecular pattern of the bone epiphysis, loss of the articular cartilage, the appearance of bone erosions. 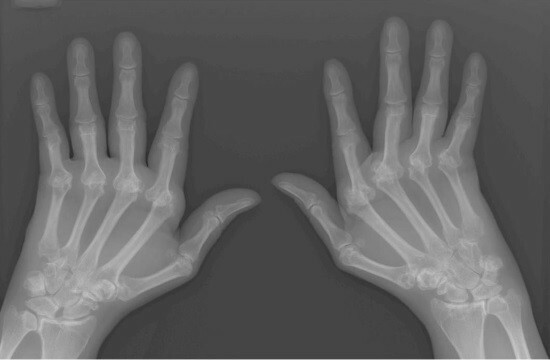 The main radiological signs of rheumatoid arthritis are marked swelling of soft tissue, osteoporosis, and slight joint space narrowing of the gap. Later, the added erosion that small marginal defects at the articular ends of the bones. Also in the epiphyses may occur rounded racemose enlightenment. Using roentgenography with direct magnification of the image, it is possible to detect a breach of integrity of locking plates still in the early stages. As disease progression was observed the worsening of these symptoms – joint tapers increasingly, there are new sources of erosion, increasing the severity of osteoporosis. Develop subluxations as a result of destruction and deformation of the articular ends of the bone. First degree. Destructive changes are absent, revealed osteoporosis of bone the epiphyses. Second degree. Weak violation of the integrity of cartilage and bone, joint gap narrowed, there are isolated Uzury. Third degree. Significant destruction of both cartilage and bone, markedly narrowed joint space, Uzury in large quantity. Observed ulnar deviation of the brush, multiple subluxations of the joints. Fourth degree. The symptoms of the third stage in combination with ankylosis of the joints. The first functional class. The implementation of the vital manipulation is unlimited. The second functional class. The implementation of the vital manipulation is somewhat difficult. The third functional class. Performing vital manipulation occurs with assistance. 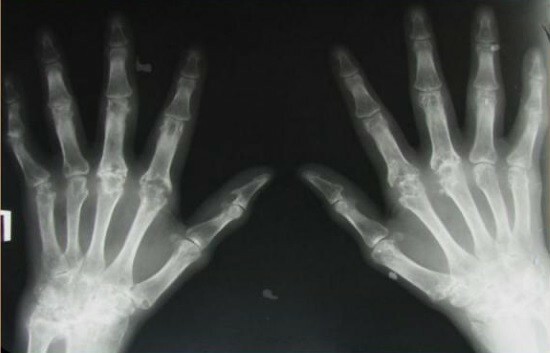 X-ray method of diagnosis in cases of suspected rheumatoid arthritis should be used to confirm the diagnosis. 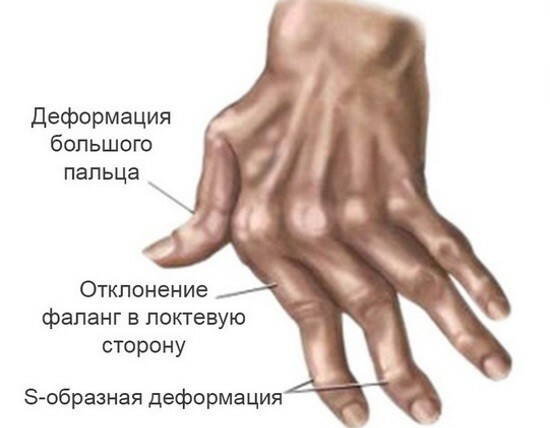 There are a number of diagnostic criteria that are characteristic of this diagnosis and provide the indications for radiation studies of the joints of the hands and feet. Detection of rheumatoid factor in the blood is a direct indication for the purpose of radiography of the joints. Typical are the complaints of the patient on morning stiffness in the joints, which lasts about an hour. Arthritis need to hit three or more joint areas – seven on the side of the body. It is worth noting that RA is pathognomonic for a lesion of the small joints metacarpophalangeal and interphalangeal areas, but can suffer wrist, shoulder, knee and ankle joints. Sometimes the process may even affect the hip area. Can occur specific rheumatoid nodules. They are most often found on the extensor surfaces of joints. They have photoelasticity consistency, are soldered to the periosteum. The procedure does not have any specific features, it is necessary to focus on the patient’s condition. The patient is not required to pre-training. The study makes a series of pictures of the hands and feet in direct projection, if necessary – review radiographs, accurate images of the articular areas affected by the pathological process. The patient should be warned of the impending study, however, lifestyle modification before images are required. READ MRI of the brain during pregnancy: is it possible? Radiation exposure is relatively small. Man receives the same dose of natural radiation within two or three days. You can also use alternative methods. Osteoscintigraphy demonstrates increased accumulation of radiopharmaceuticals in the areas of the affected joints in the first weeks of the disease. 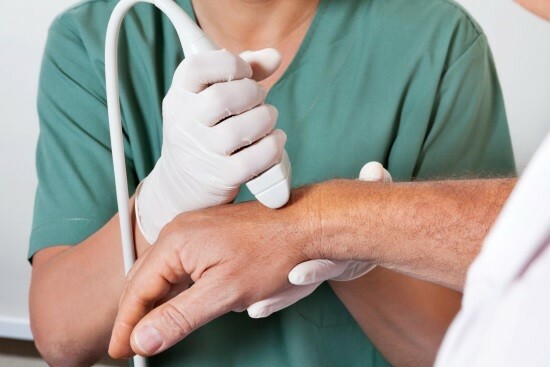 Of non-radiation methods of diagnostics can be applied sonography, which shows thickening of the synovial membranes of the joints, the appearance of fluid in their cavities, changes of articular cartilage, the presence of synovial cysts, as well as the degree of periarticular edema.